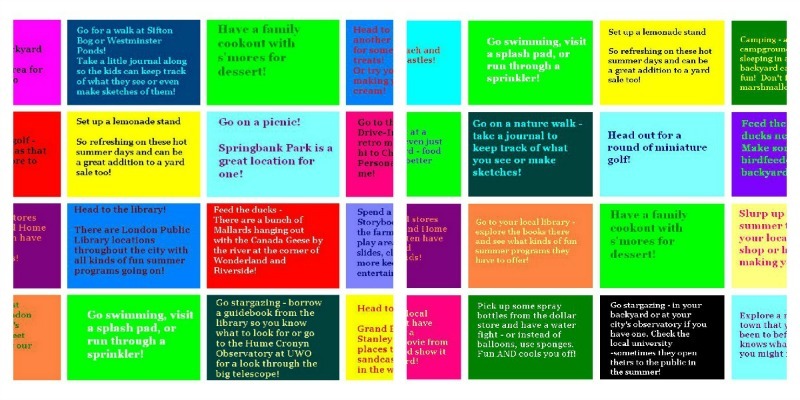 Here’s the first of 9 posts in my series: Summer Fun Fridays, a celebration of fun family ideas to try out this summer! Below you’ll find your choice of two charts that you can print out and use with your kids to plan out some fun summer activities to do together. (how many more times do you think I can add the words summer and fun to this post?) The first is one designed especially for the London, Ontario area with regional suggestions on it. The second is a more generic one that could be used virtually anywhere. You could print them out and use them as a bingo game board – challenge yourselves to complete an entire line or maybe one horizontal and one vertical line or how about the whole board? You can suit it to your family’s needs and available time. Or cut the squares apart, pick out the ones you want to do, and stick them right onto the calendar on the date you have planned. Feeling adventurous? Cut the squares apart, fold each one in half, and put them in a jar. When you need an activity, one of you can draw a paper from the jar and whatever is on that paper is what you do that day! Have a great summer with your family! 5 Days of Summer Fun Fridays Live Shows!